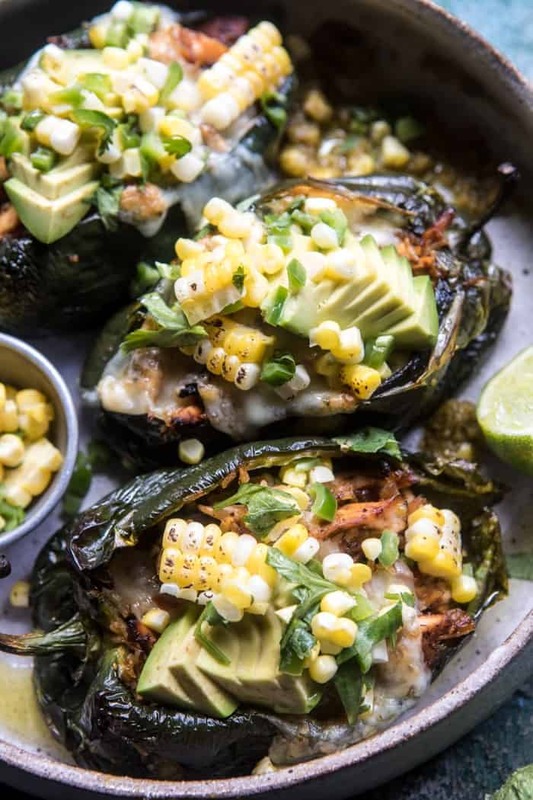 Yes, a family favorite, meaning everyone in the fam, including my picky brothers, love these stuffed peppers. In fact, my brother Malachi was actually the one who suggested that I make them a few weeks back. 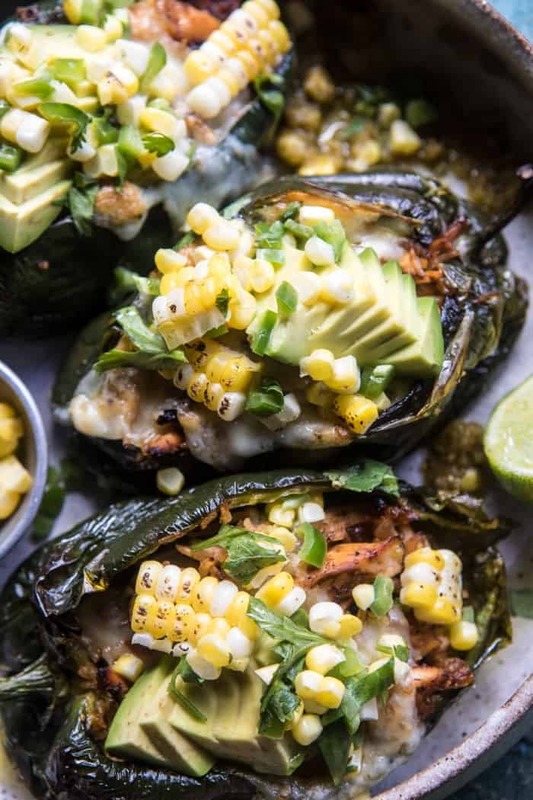 When he text me asking if I could make him chicken stuffed poblano peppers, my eyes widened with shock. I didn’t even know Kai ate peppers, but apparently he does, and I am pretty happy about it…especially since Kai does not eat many vegetables (yes, he is 21 years old). His request could not have come at a more perfect time, as I was having one of those days when being creative was just not happening. What I love most about my job is that it allows me to be creative almost everyday, but the problem with having to be creative everyday is that you have some days, or even weeks, when the creative juices are just not flowing. I’ve had a string of those days in recent weeks, which has not been all that fun. Thankfully, I’m feeling a little more refreshed today as I settle back into being home and back to work after our trip to Cleveland this week. We ended up extending our stay an extra day to be able to spend a little more time with my mom’s siblings, which I think everyone, especially my mom and aunts, were really happy for. It ended up being a rainy day, but that was perfect because all of the previous days had been jam-packed and full of so much activity that a rainy day was just what everyone needed. We are finally home today, and as mentioned, I’m really excited to dive back into work. I’m even feeling some new motivation and energy, which I really needed! Which brings me back to these peppers. I wrote the recipe based off of these enchiladas. So basically these peppers are enchiladas minus the wraps, which in turn makes them on the lighter side, and just a little bit more figure friendly. But don’t worry, I was sure to include plenty of cheese on top because you know, there aren’t many recipes I’ll do without cheese! Okay, here’s how this recipe works. It’s pretty quick, simple, and easy, so I’m loving that it fits in nicely with our back to school theme for the month. Start with the chicken and peppers. Season up the chicken and add the whole peppers to a baking pan, then roast everything up. You want to roast the peppers before stuffing them so that they’re easier to work with. Next you’ll shred the chicken, toss it with some salsa verde, cheese, and rice, and then stuff all that inside the peppers. Top with a little more cheese and place them back in the oven until the cheese has melted. I topped each pepper with an avocado and corn salsa and then called it a day. 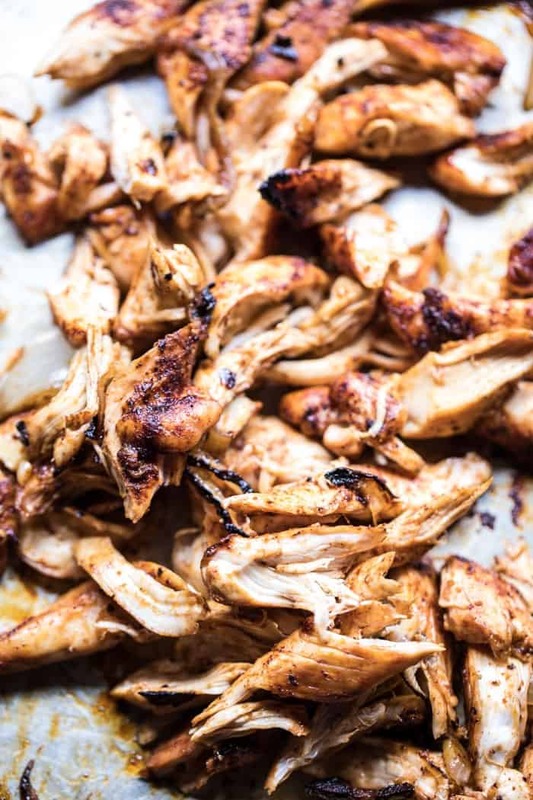 I LOVE the combo of simply using seasoned Mexican chicken with a smoky poblano pepper and plenty of cheese. It’s honestly just so good. Like so deliciously good. Stuffing rice inside the peppers along with the chicken makes these more of a complete meal. Plus, we just love rice over here. Also, if you have the time, I highly recommend making homemade salsa verde with all the tomatillos that are in season right now. Nothing beats a homemade salsa verde (I love this easy recipe). So what do you guys think? 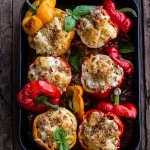 Stuffed peppers for dinner tonight? It’s sounding pretty good to me. 2. Place the chicken on a baking sheet and rub with the olive oil, chili powder, and paprika. Season with salt and pepper. 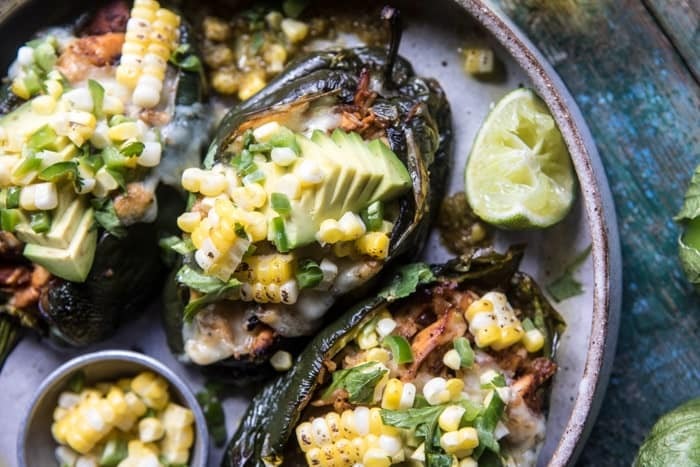 Add the whole poblanos to the baking sheet. Transfer to the oven and bake for 20 minutes or until the chicken is cooked through. Remove the peppers from the pan and set aside. 3. Shred the chicken with two forks. Add 1/2 cup salsa verde, the rice, 1 cup cheese, the cilantro, and toss to combine. Pour 1/2 cup of the salsa verde onto the bottom of a 9x13 inch baking dish. 4. Cut a slit down the length of each poblano pepper. Using your fingers remove, and then discard the seeds from each pepper. Stuff the chicken mixture inside the peppers and arrange in the the prepared baking dish. Pour the remaining salsa verde over top of the peppers and then top with the remaining the cheese. Transfer to the oven and bake for 15-20 minutes, until the cheese has melted. 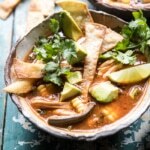 Remove and top with the Avocado Corn Salsa. In a medium bowl, gently toss together all the ingredients. Keep stored in the fridge for up 2 days. Yum, the perfect Thursday night dinner. Mini Italian Meatball Mac and Cheese Stuffed Peppers. Sorry to hear of the passing of your Grandma, she sounds like one special lady giving you & your family great memories. I have the best memories of my Grandma & Grandpa, and was very lucky to have grown up with my Great Grandma & Great Grandpa as well. Very kind people, great values, that they have passed on to me & I hope to pass on to my children. Oh, but Grandma’s recipes, I remember her pumpkin pie, her minestrone soup & her cornbread…OH YEAH!!! I think there was a chili involved & my mom said there was a pork chop thing with collard greens, but i don’t remember that. Sounded like a beautiful service for her. Grandparents Day is coming in September, but you can celebrate her everyday in your own way. I’m all about the Mexican Tex/Mex food, gonna be trying this one soon, looks amazing. That is so amazing that you got to grow up with your great grandparents as well, Karen! Oh and all of those recipes sound so good as well! I hope you love this recipe! Thanks! I made this recipe yesterday & OMG!!!! Amazing, super tasty. Me & the kids loved it, will make again, Thank you!!! I am so glad you liked it Karen, thanks for making it! Yum!! This sounds right up my alley! I hope you love it! Thanks Alexis! Looks delish as usual! I recently switched over to a more plant-based diet, so when making this I’d take out the chicken and adjust more things accordingly. But it looks like that’d be easy to do while still keep the flavour. Thanks for the creativity! That is great Leanne! I hope you love this recipe! I am sure they would be! Thanks so much Rebecca, I hope you love this! YES! SO perfect, hope you love them!! 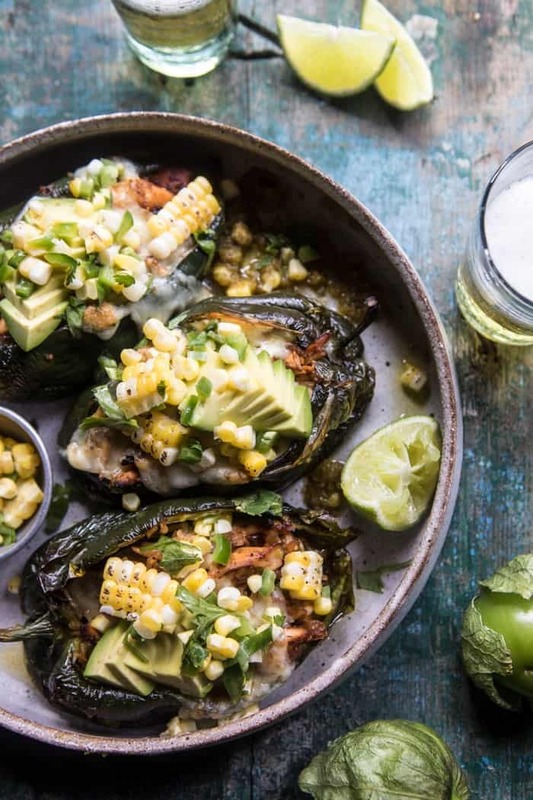 All of this comes at such perfect timing in Colorado – Poblanos, corn, tomatillos … it’s going on the grocery list for next week! Thank you! YUM. YES!! Hope you love them thanks Kristen! Hi Teighan… in the comments where you had mentioned that these were like your enchiladas…I think you forgot to ‘link’ to the enchiladas? 😀 Love your stuff! You do not recommend removing the blistered skin – why not? Hi Jo, I like the texture of the skin. If you prefer, you can remove it. Hope you love the recipe! These look so good! 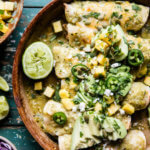 Love how you took enchiladas and lightened them up. Glad you’re feeling a bit more settled. SO so happy you like them Natasha, thank you!! Why… WHY do I always want to change what I’m making for dinner to whatever new delish dish you’ve just shared with us. It never fails!! 🙂 But I guess I won’t this time as I already have your Rosemary Peach Chicken in a White Wine Pan Sauce on the menu for tonight!! These do look and sound fabulous and I will be making them sometime soon! I do just love to stuff stuff. The recipe looks wonderful, mouth-watering! But I’ll take it lightly on Pepper. 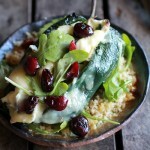 I’m enjoying every day more of this blog … you have fantastic recipes here. Congratulations! I know this isn’t southwestern but I’m going to add a sprinkle of bacon! I don’t think I see in the recipe. Do you leave the corn raw or do you roast it first? Hi Sue, I am sorry for any confusion. I like to leave the corn raw. It’s burst in your mouth and I find it refreshing and sweet. Of course you can roast the corn first if you prefer. Please ket me know if you have any other questions. Hope you love the recipe! Made this awesome dish tonight for dinner. I got everything I needed for the recipe except the avocado at the farmers market this morning. Got rave reviews from the fam. Can’t wait for the cookbook! So happy you liked it!! Thanks Kathy! Hope you love the book! At home (CDMX) we peel the poblano peppers. You roast them until the skin is burnt(crispy) , put it inside a plastic bag for 5min (helps the peeling process) and then peel them in cold water. It will take the bitterness from the pepper. I love the taste of the skin, but thank you so much for the awesome ti. I will try that! Have a great weekend! an awful lot of text for only hɑving 1 or 2 pictures. Maybe you could ѕpаce it out better? Hi, I actually just changed the design of my website and always add around five photos to my recipes! I hope you like it! Made this for dinner tonight and it was amazing! It’s a great recipe and easy to follow. We will definitely be making this again! Made this tonight it was delcious!. Thank you. YUM! This is so good; I’d give it 6 stars if I could! I am so happy to hear that! Thank you!! Just made this and had it tonight for dinner. Oh, WOW!, it’s just fabulous. I wouldn’t change a thing. Hubby loved it too! I am so happy to hear that! Thank you Karen! content, except this website presents feature based posts. our next write ups thank you once again. Wow!! These are great! We doubled the recipe and ate them for a few days. 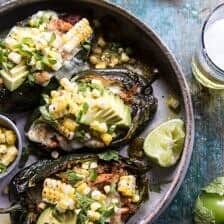 Best stuffed poblano peppers we ever had. We live in Texas and have had a few, but none this good. That is so sweet! Thank you so much Jerri! you also have the ability to select from different genres. “Because you are here reading this flash games report now with this particular point in time; everything you have is “The first movers advantage” by yourself to look at a your hands on now. Technology is driving dynamic advertising into new areas this also brings with it some potential challenges, well its not all companies can afford to cover thousands in electronic advertising, well both options highlighted can offer the same results with low investment of time and cash, so now any organization from mechanics to dentists might have these inside their guest waiting rooms. Hello there, You’vedone a fantastic job. I’ll definitely dihg it and personally recommend to my friends. Thank you so much Eva! I am so glad this turned out so amazing for you! So glad you enjoyed this recipe! Thanks!